Anatoly Konenko since 1981 first in Siberia began to pursue art of microminiature. Within a short period of invented and mastered the technology of writing on rice, poppy seed, then a human hair. A new direction in art demanded a radically new approach in creating new works, design and delivery microcompositions. Anatoly Konenko many of their works shall submit a scale compared to insects, seeds or hairs, that allows a winner to show the uniqueness of the work performed. 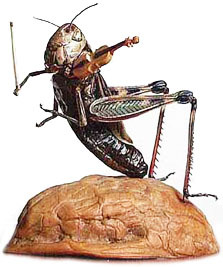 Violin in grasshopper legs creates a well-known poetic image, horseshoes on paws flea allow the imagination to revive the scene leskovskogo Lefty, a caravan of camels in the eye of the needle reveals biblical line at the impossible. Anatoly Konenko technology developed and implemented a number of papers in micropaint, drawing, sculpture, carved bone and stone fruit trees, prototyping, jewelry, woodturning direction, embroidery, knitting, tatting, patchwork, miniknigah. Microcompositions by A. Konenko are in the collections of Russian, Korean, Belarusian, Czech, Slovak presidents. The cost of such well-known miniatures as savvy flea, camel caravan, a grasshopper with a violin is around 50,000 euros. One area where Anatoly Konenko proved himself the most common - is a miniature book. Miniature books Anatoly Konenko differ impeccable quality of binding, the unique elegance of birch bark ornaments, and some are striking in their originality. In the enactment of micro-mini and Anatoly Konenko is an artist, designer, engraver, a bookbinder. Все книги переплетены и оформлены вручную. All books are intertwined and decorated by hand. Thus, every book is a work of art. In 1997, using his skills in the field microart, Anatolia Konenko able to publish the lottery supermicrobook smaller than 1 mm, and in all parameters (size, number of pages, lines and letters on the page, hardcover, color illustrations), it surpassed the Scottish (1 x 1,5 mm), published in 1986, it officially was announced at the XV World Kontresse in Vefleeme (USA), where Anatoly Konenko presented his supermicrobook Chekhov's "Chameleon" size 0,9 x 0,9 mm. In 2002 she was entered in the Guinness Book of Records. This record has put Russia in first place in the world in the field of micro-publishing skills. For the nine collectors Anatoly Konenko produced the world's smallest size of ex libris 0,5 x 0,7 mm. In 2006, Anatoly Konenko together with his son Stanislas Konenko issued supermicrobook size 0,8 x 0,8 mm. "Alphabet". Offset printing in two colors. Published 13 alphabets of the peoples of the world. In 2010, published 9 books of less than 1 mm. The smallest of them - 0,1 x 0,1 mm. The contents of this site (text and graphics) are owned Anatoly Konenko. Use of these materials without the written consent of Anatoly Konenko prohibited.